Surface Condition signs are a smart choice for alerting road users to existing road surface conditions or when changes in the weather adversly affect them. 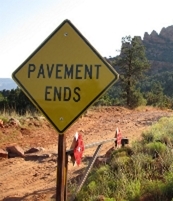 Post these signs in advance of an existing or potentailly changing road surface. A wide selection of surface condition signs for municipalities & government entities, HOA's, builders, developers, businesses & property owners.